ImageShack is one of the popular image hosting websites on the Internet. The service has been around for a long time and open to users from all over the world ever since it was created. Up until February of 2011 everyone was able to embed images on their own website. Visitors were able to view those images, regardless of the country they came from. This changed on February 23 when ImageShack began to enforce a new policy that separated users from "first world" countries from the rest. The change however did affect all users of the service, either directly or indirectly. The policy changed to whom images are displayed on third party websites. Users from the US and Europe were able to see ImageShack images that were embedded on third party websites. Users from other countries however could not see the ImageShack images anymore on those website. They would see a dummy image instead that informed them about the change with the sentence: "your country can only view this image by logging into ImageShack". To make matters worse, some webmasters noticed that the images they had embedded on their websites were replaced as well with another dummy stating "Unregistered domain. Go to http://imageshack.us to register". And this change affected users from all countries. These are two related issues. It appears that ImageShack is checking the IP address of every user who is requesting an image that is hosted on their site. If the IP lookup reveals that the user is not coming from a country in the whitelist, the dummy image with the log in to view the image is displayed. 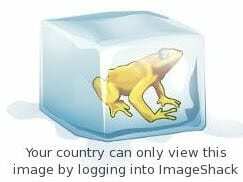 Webmasters who have been using ImageShack to directly embed images on their websites that they have uploaded to the image hosting site will see a slightly different version of the frog in ice. This basically means that ImageShack performs two checks: They check the user's IP to see if the country is in the whitelist, and they check if the website the image is embedded on is registered. ImageShack displays solutions to resolve both situations on the dummy images. Users from blacklisted countries need to register, log in and stay logged in to view images on third party websites. Webmasters are asked to register their domain so that the replacement image is removed and the "real" images are shown on the website again. The Imageshack homepage does not link directly to the domain registration form, nor does it reveal any information about the process. The Faq and Blog do not reveal information either. Webmasters need to visit this page to register their domains with ImageShack. Regular users need to visit the ImageShack sign up page instead to register an account with the image hosting site. Webmasters have only two choices. They can register their domain name, which they should do anyway to display the images again on their website. They then have the option to use another image hosting service for future images, preferably one that is more reliable and communicative when it comes to changes that impact embedding images on third party websites. Another option would be to move the ImageShack images to another hosting service. This option may not be practical depending on the amount of images and pages of the website. A user with 100 pages and 10 images on each would have to upload 1000 images and change the embed code on all images. A viable hosting alternative that webmasters may want to take a look at is the image hosting service TinyPic. Regular Internet users from blocked countries can alternatively use a web proxy, virtual private network or other tool to hide their original country so that they can view the embedded Imageshack images directly without having to register and stay logged in. Check out or web proxy listing for a start. Bandwidth could be a core reason, or more precisely the bandwidth to ad revenue ratio. Ad revenue is highest for users from the US, Canada, UK, Europe (west) and some other countries. Maybe they have found out that it is not cost-effective to display images to users from other countries. Many factors do play a role here though that they would have to add to the calculation. Just look at the bandwidth consumption vs. the ad revenue would not be enough. Indirect factors, e.g. how many visitors from whitelisted countries view images on unregistered domains or the mouth to mouth advertising come to mind. It could also be that ImageShack tries to grow their registered user base and domains that they serve, for instance to show growth and make the company more attractive to potential advertisers and buyers. But this is all speculation on my part. The fact that stands is that ImageShack has made a change to their site that affects many users and webmasters. To make things worse, the company failed to communicate that change to their user base. Then again, it is their good right to make changes to their service, even if it alienates a large part of their user base. Have you been affected by the change? What were your consequences? I never used ImageShack for image hosting purpose. But I regularly visit sites which have images hosted into ImageShack and for a couple of weeks I’ve been getting ‘Unregistered Domain’ error on a lot of images everywhere. Whatever reason they have behind implementing this new policy, I believe, is not gonna help them in the long run. I’ve been a user of TinyPic for a long time but lately they have banned my account without any prior notice or reason. Also it is quite annoying to fill up captcha every time you upload a image on TinyPic as a guest user. I have Photobucket too, but their uploader is really slow and the site is bloated. Now I’m using imgur (http://imgur.com/) which seems pretty nice so far. It has a fast uploader, upload by drag n drop, lots of 3rd party tools for different platforms and tiny links for hosted images, like TinyPic. I was wondering when gHacks would pick this story up, since it has been around for quite some time and many users, including myself, got baffled by the change. I have never seen the country-specific message, only the unregistered domain message. When I first encountered the problem I followed the link specified in the image, and it stated that you need to be logged in to view images or register the domain you want images to appear in. It allowed _anyone_ to register domains, not only site owners or administrators. That worked for a while, until they changed it so that _only_ administrators or site owners can register domains. Talk about bad decisions at every turn (the first one being the change in policy that got many users who rely on their service surprised, without some substantial press converage for the impending change). I would like to add that apart from having the domain registered with imageshack, it is also important that a sufficient HTTP_REFERER header is properly sent (I mentioned sufficient, because sending only the domain as referrer is sufficient enough without sending the whole url, for the privacy concious.) That is how imageshack knows when to allow the requested image from their server, by checking the domain from the referrer if it is registered. I was blocking referrers as a standard practice, and after some troubleshooting I found out that a referrer is needed for requests made to imageshack. Good thing I chose Flickr. “Block – Send no refers” And hit Ok.
That tip would be counter-productive. As I have said earlier, blocking referrers would only result in the frog image being displayed for sites that hosts images from imageshack. An alternative tip, one which I have not yet tested myself but instead in theory should work, is to send a fake domain, preferrably one that has already been registered, referrer to imageshack, such that for example if I’m visiting ghacks.net and it so happens ghacks.net is not yet registered, then via the add-on I can override referrers sent to imageshack.us as http://domain.com/ where domain.com is a registered domain for all image requests to imageshack, irrespective of from whatever site the request is coming from. I have mentioned about referrers because some users might unknowingly be blocking or modifying referrers done by their firewall, or some other software running in their computer or network, and when this happens and you see the frog, then better check the referrers. Have you tried the tip yourself? Did you ask yourself how imageshack is checking domains and when to allow image requests for registered domains if the _only_ way to do such thing is to check for the referrer from the HTTP_REQUEST headers? Before you provided the tip, at least verify the tip yourself. The information made public on the internet superhighway is abundant, and one must guard against the pitfall of such repositories of knowledge: misinformation.